‘Benjamins’ is American slang for money but it was characterised as being an antisemitic reference, a ‘trope’ as some like to say, indicating the control of the American political system by ‘Jewish’ money. Ilhan apologised for the unintended ‘trope’ but reaffirmed her concerns about the role of lobbyists in American politics. 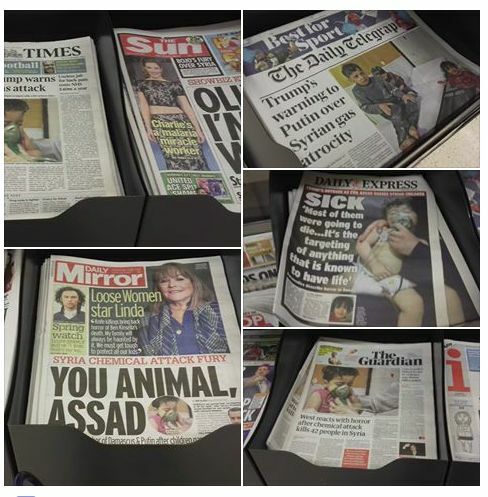 It’s hard to believe that I posted these pictures of some newspapers to Facebook just two days ago. In the space of three days since Monday morning the world has come to the point where the two most powerful nuclear armed nations are threatening to go to war with each other. Douma is part of the East Ghouta where the Syrian government have been fighting the rebel/jihadi groups that have occupied the area. THey had defeated most of the rebels and recaptured most of East Ghouta when the Douma incident happened and the Syrian government of Bashar al-Assad was accused of using chemical weapons on Douma. Over the past three days I have posted a lot of stuff to Facebook and taken part in a number of discussions in Facebook groups. I don’t want to lose track of that content so I am reproducing some of my Facebook posts to this blog. Propaganda and media distortion has been a feature of the Empire’s war on Syria since 2011. I like this congresswoman, Tulsi Gabbard. But Wolf Blitzer’s attempt to blame 200,000 to 300,00 deaths on Assad should be challenged. As well as supporting the insurgents militarily the US and its allies have been waging a propaganda campaign targeting Assad. We should not trust anything we hear on the mainstream media without examining it thoroughly. As East Ghouta is liberated from the terrorists we see moving videos of their hostages exiting the liberated neighbourhoods. They are grateful to the army, they shout ‘God, Syria, Bashar’. This looks like a film produced by a state broadcaster but can anyone look at the faces, the emotions of these people and tell me that they are not genuine? The Russians informed the UN about chemical armaments found in liberated areas of East Ghouta almost a month ago. This video of suffering and dead children is distressing. 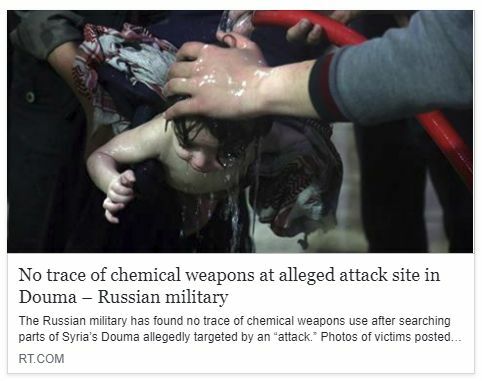 Maybe it indicates that they were victims of chemical agents but it does not indicate that the were victims of the Syrian government using chemical weapons. It is counter intuitive, contrary to reason, to believe that with the Syrian Army on the brink of victory in Ghouta that they would needlessly use weapons whose use would give the worrld’s most powerful armed forces to attack them. I don’t know how the chemicals might have gotten to the rebels/jihadists but look at this video from Tom Duggan a British journalist living in Damascus. He is walking through an arms factory in a liberated area of East Ghouta. It is clear that the rebels/jihadists have access to quite sophisticated armaments. It is clear that military supplies are coming in from somewhere. The stakes are high. I’m not going to speculate about the Skripal case here but the way it has been used is to try to isolate Russia. This fits in with an agenda to attack Syria while Russia is on the backfoot. There is clearly coordination between the US and UK governments. “They are liars. And they know that they are liars. And they know that we know that they are liars. Exactly so. Everyone who looks knows that the US/UK are lying. Ja’afari tells them that he expects them lie about a chemical attack in order to justify an attack and a month later there is a chemical attack and they are using it to justify attacking Syria. Speaking of liars, here is Boris Johnson explaining how much the UK was giving in ‘non-humanitarian aid’ (what that) to help the White Helmets and to fund ‘police forces’ in Hama, Aleppo and Idlib, you know, the areas that were occupied by rebel/jihadists aka terrorists, at the time. What justifies setting up police forces in someone else’s country? Unlike the case in other incidents Russian forces now have control of part of Douma and are able to inspect and invite inspections of the alleged chemical attack site. 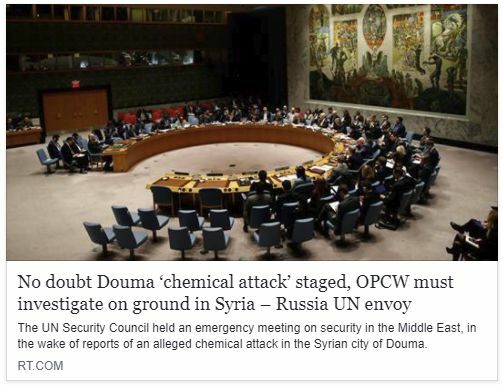 The UN special envoy for Syria, Staffan de Mistura, opened the meeting by describing the reports about the alleged chemical attack in Douma and the subsequent airstrike against the Syrian T-4 air base. He called for an “independent investigation” of the alleged chemical incident and urged restraint for all sides, in view of the airbase attack. When push comes to shove will Russia shove back? 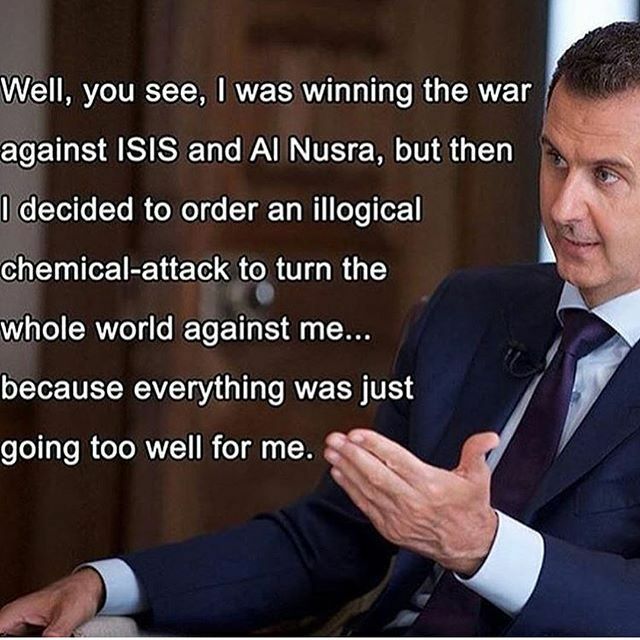 There is no evidence that ‘Assad’ carried out a chemical attack, there is no verifiable evidence that there was a chemical attack, evidence is beginning to emerge that there was no chemical attack. Good work from Lee Camp. What he says about the NY Times is pretty much true of our mainstream media also. Please everyone look at EVERYTHING with a critical mind. US Democratic Congresswoman Tulsi Gabbard is asked in this interview with CNN’s Wolf Blitzer if she believes the Russian narrative over that of the Pentagon. She responds that what she or anyone else ‘believes’ is irrelevant, what matters is the facts and the fact is that a US president took an illegal action on the basis of an unsubstantiated claim. Blitzer’s talk about Pentagon radar data is disingenuous as he should know that this information was shared by the Russians prior to the attack. This video contains imagery of children gasping for air as a result of a purported chemical attack. It is presented as an atrocity of war. It is distressing. The aftermath of any act of war is distressing. Images of children with limbs blown off would be no less distressing. The video of a child having his head sliced off by terrorists would be no less distressing. This video is presented as a special case, as specially atrocious, for a reason. Although the video says clearly that, while the US blames the incident on the Syrian government, this is denied by the Syrian government and the Russians blame it on an inadvertent strike on a terrorist held chemical munitions factory, the impression we come away with is that the culpable party is the Syrian government and that ‘something must be done’. For something to be done we must understand what is happening here and too many of us do not. 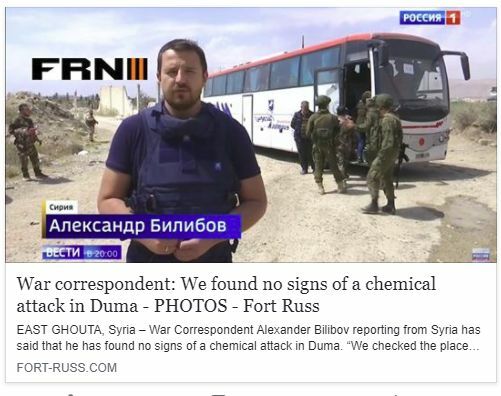 I don’t know whether the chemical incident was the result of a conventional attack that struck a terrorist chemical gas repository and released the toxins, as the Russians say or if it was staged in some way by the terrorists and their backers. I tend to believe that the latter scenario is correct given the quality of the video production and the immediate and seemingly coordinated response by the US and their allies. What I do not believe, and what defies common sense and circumstantial evidence, is that the Syrian government deliberately used a weapon whose use would give the excuse for action against them. I doubt that President Trump believes this because, despite his many flaws, he recognises a scam when he see one (who better?). Trump’s speech about being flexible changing his mind felt to me like that of a captive with a gun at his back. Whatever Trump’s motivation we must not fall for this. We must not allow anyone we know to fall for this. This is part of the imperialist modus operandi, name something as an atrocity or potential atrocity and then go to war committing far worse atrocities that the one they named. Those who the ‘gods’ would destroy they first defame as mad or bad. Idlib is a terrorist stronghold supported by the US, UK and Israel. They will not allow the Syrian Arab Army (SAA) to retake it. Also they will not permit a resolution to the Syrian conflict that leaves Bashar al Assad as president and Syria as a whole and independent secular state. As the conflict moves towards its end state Syria’s enemies become anxious to frustrate that resolution. Following his speech Trump launched an attack on a Syrian airbase. On 4 April 2017, the town of Khan Shaykhun in the Idlib Governorate of Syria, was struck by a heavy airstrike followed by massive civilian chemical poisoning. At the time of the attack the town was under the control of Tahrir al-Sham,formerly known as the al-Nusra Front. The President of the United States, Donald Trump, as well as the UK Foreign Secretary, Boris Johnson, blamed the attack on the forces of Syrian President Bashar Assad, while the Russian and Syrian governments said it was caused by the Syrian Air Force’s destruction of a nearby rebel-operated chemical weapons warehouse. In response, the United States launched 59 cruise missiles at Shayrat Air Base, which U.S. Intelligence believed was the source of the attack. The United States was fully briefed on the fact that there was a target in Idlib that the Russians believes was a weapons and explosives depot for Islamic rebels. We know it was not sarin. How? Very simple. The so-called “first responders” handled the victims without gloves. If this had been sarin they would have died. Sarin on the skin will kill you. The picture of Michael Gove reminded me of Mad Magazine’s Alfred E Newman, I searched for images to confirm the resemblance but didn’t expect to find anything quite so eerily similar. Hands up in surrender? 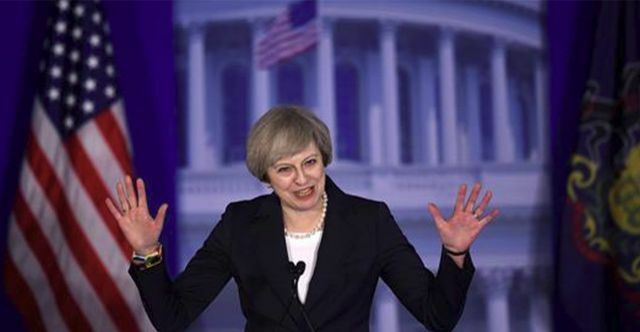 She says “The days of Britain and America intervening in sovereign countries in an attempt to remake the world in our own image are over”. I have no idea whether Theresa May means it or whether Trump means it but this is like murderers saying that they’re not going to murder anymore. It’s a confession. Not a statement of regret or an admission of guilt but a confession that their states have been complicit in sowing chaos and destruction that has resulted in the deaths and maimings of hundreds of thousands and the undermining of their security and wellbeing. Trump and May might blame previous administrations but they are representatives of a rabidly murderous system whose crimes are obvious to anyone who looks even a little under the lies and distortions of a western media that has largely acted as the propaganda arm of a rapacious Anglo-American empire. I was re-reading a BBC article from September 2016 about the findings of a UK parliamentary committee, the foreign affairs committee, criticising ‘the intervention by Britain and France that led to the overthrow of Libyan leader Muammar Gaddafi in 2011’. This report is effectively Parliament’s attempt at a Chilcot inquiry into the Libyan intervention, only quicker and shorter. And the criticism is weighty: the government’s poor intelligence about the threat to civilians in Benghazi, its lack of awareness of Islamist elements among the rebels, the policy drift from saving lives to getting rid of Gaddafi, and David Cameron’s lack of strategy for what should happen next. The committee said “political options” were available once Benghazi had been secured – including through ex-PM Tony Blair’s contacts with Gaddafi – but the UK government “focused exclusively on military intervention”. “Muammar Gaddafi was unpredictable and he had the means and motivation to carry out his threats,” a spokesman said. “His actions could not be ignored and required decisive and collective international action. Throughout the campaign we stayed within the United Nations mandate to protect civilians. The alternative, she added, “would have been to stand by and witness another massacre of civilians”. Today, Libya is in ruins. The seven months of NATO bombing effectively destroyed the government and left behind a political vacuum. Much of this has been filled by extremist groups. Millions of Libyans live without a formal government. The internationally recognized government only controls the eastern part of the country. Rivaled extremist Islamist groups have seized much of the country. Downtown Benghazi, a once thriving city, is now in ruins. Ansar al-Sharia, a fundamentalist Salafi militia that is designated a terrorist organization by the U.S., now controls large chunks of it. ISIS has made Libya home to its largest so-called “caliphate” outside of Iraq and Syria. Thousands of Libyans have been killed, and this violent chaos has sparked a flood of refugees. Hundreds of thousands of Libyan civilians have fled, often on dangerous smuggling boats. The U.N. estimates more than 400,000 people have been displaced. … the facts show that [Clinton] did not just push for and lead the war in Libya; she even went out of her way to derail diplomacy. Little-discussed secret audio recordings released in early 2015 reveal how top Pentagon officials, and even one of the most progressive Democrats in Congress, were so wary of Clinton’s warmongering that they corresponded with the regime of Libyan dictator Muammar Qaddafi in hopes of pursuing some form of diplomacy. Qaddafi’s son Seif wanted to negotiate a ceasefire with the U.S. government, opening up communications with the Joint Chiefs of Staff. Clinton later intervened and asked the Pentagon to stop talking to the Qaddafi regime. Rep. Dennis Kucinich wrote a letter to Clinton and Obama in August 2011, warning against the war. “I have been contacted by an intermediary in Libya who has indicated that President Muammar Gadhafi is willing to negotiate an end to the conflict under conditions which would seem to favor Administration policy,” the Democratic lawmaker said. His plea was ignored. A Pentagon intelligence official told Seif Qaddafi that his messages were falling on deaf ears. “Everything I am getting from the State Department is that they do not care about being part of this,” he explained. “Secretary Clinton does not want to negotiate at all,” the U.S. intelligence official added. No error, but cold, deliberate murder, not of one man, but of a whole nation. Yet there are those who regret that Hillary Clinton is not the US President Elect. There are those who say that she was not elected because she is a woman or that Trump appealed to white racism. If this were true, and I do not believe it is, then we should all, for once, be grateful to sexists and racists. Bashar al Assad said, of the liberation of Aleppo, that it was a pivotal moment in history, not just for Syria but for the world. I hope Assad is correct that the Liberation marks the moment when the world, enough of the world, clearly sees the pattern and sees through the lies of the Camerons, Obamas, Sarkozys, Clintons, Hollands and their cohorts. These are not respectable people, they are not at all decent and their intentions are not good, their intentions are evil and their actions are evil and the consequences of their actions are evil. I don’t like saying this because these people are our leaders and are supported by our democratic representatives and our political structures, by our whole political and media establishment. What does this say about our structures, our beliefs? There is a saying ‘Fool me once, shame on you, fool me twice, shame on me.’ The first time I have been fooled, the second time I am a fool. But fool me thrice? The third time I must be an accomplice.